Do you know how long it takes to get people executed in this country? All these guys hanging around death row forever, claiming they're innocent or some such thing? Enough, already! American justice is about to get a little bit faster! The US is preparing to bring in legal changes giving Attorney General Alberto Gonzales new powers to limit the time inmates spend on appeal on death row. New powers for Alberto Gonzales? Why on Earth would we give more power to Alberto Gonzales?? The change in the rules, under which Mr Gonzales will be able to decide state requests to speed the appeals process, was a measure in the 2006 Patriot Act. Wow. Because of the PATRIOT ACT, Alberto Gonzales gets even more power, and this time it's the power to limit the appeals process of people who've been sentenced to death. How quaint!! And that's the good news! Death penalty experts argue that shortening the time allowed for inmates to appeal, in what are often very complicated cases, will make effective and fair review very difficult. The new procedures will cut down the amount of time that death row inmates have to appeal to the federal courts, once the state court has ruled, from one year to six months. The federal courts will also have less time to review the cases before them, which represent the only opportunity defence lawyers have to file new evidence. 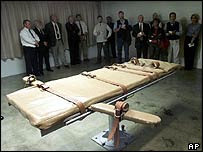 Elisabeth Semel, director of the Death Penalty Clinic at the University of California law school in Berkeley, told the BBC News website the new rules represented a "very dramatic change". She fears that not only the few death row inmates who turn out to be innocent but also those who have been unfairly given the death penalty will lose out. And, she points out, those who decide whether to limit the appeals process are the same people as are seeking a faster process. You see the problem? We've got an attorney general who can't remember to tell the truth about simple things when he testifies before the people's representatives, a man sworn to uphold justice who has in fact done enormous damage to pillars of legal history, a man under threat of possible impeachment for these and other crimes including politicizing the nation's Department of Justice for partisan political ends. What do you do? Give him more power, of course! Power of life and death over defenseless people!! "It's like giving control of the hen house to the fox, because it's the attorney general in the state going to the attorney general of the US and getting permission to do something that kills the chicken." It's getting pretty cold, don't you think? It's been getting colder and colder for quite a while now, and it will continue to get colder and colder, and colder and colder, as darkness encroaches ever further on this shining beacon on the hill ... unless we do something about it ... now, while we still have a chance!